The final push is here: whether you triumph together alongside familiar teammates or take matters into your own hands on the solo ladder. With the end of season comes ranked rewards featuring the Victorious Maokai skin, loading screen border division markers, and all new rewards for the most elite players at the top of the ladder. The season ends the night of November 7. A new evolving ward skin unlocks exclusively for those who hit their squad goals and pick up enough points for each ward skin tier. Earn tier rewards via ranked teams! Rack up at least 10 wins with your team and you’ll unlock tier rewards according to your team’s rank. You’ll unlock the highest tier rewards earned by any team you have at least 10 wins playing alongside (you do still need to be on that team at the end of the season, of course). The 2016 season wraps up at the end of day (in your territory) on November 7—technically this means 12:01 AM on November 8. Rewards will arrive within two weeks of the end of season. 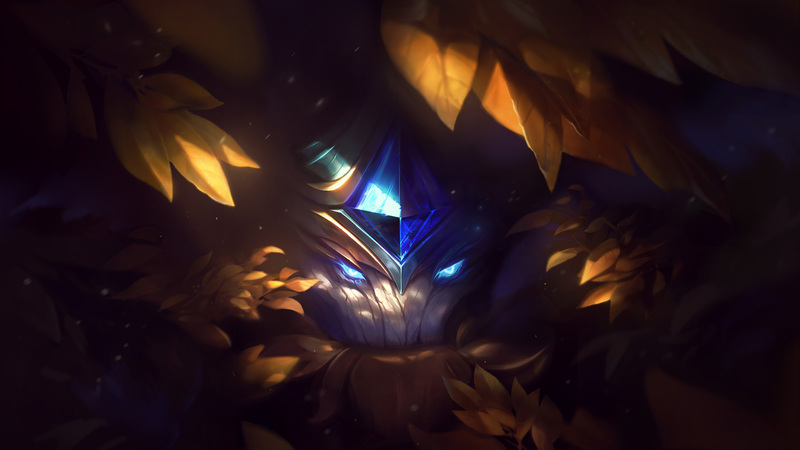 If you’re Gold+ and don’t own Maokai the champion will be unlocked alongside your new skin. You won’t! We’ll disable decay alongside the season’s end. We’ll turn it back on once the 2017 season begins! So that’s it, no more ranked this year? Having some downtime between seasons has historically given us a chance to make bigger changes than when ranked competition is in flight. We’ve improved our approaches to iterating on balance, so we’re looking to potentially have a shorter preseason this year than in the past. What do you think? Let us know in the comments if you think ranked should return sooner! Players issued a ban of seven days or more in the three months prior to the end of the season (from August 7 on) are ineligible for this year’s rewards. Players banned for boosting during the 2016 season remain ineligible for rewards. Players who experienced fraud-related and erroneous bans will still be eligible. Can you tell me more about the Challenger rewards? Information on the Challenger rewards (including a visual reveal and eligibility requirements) will be coming soon in a separate announcement. Sit tight! What do you mean 10 wins with the same team? Being a popular free agent is fine, but you’ll only earn rewards for the highest ranked team you’ve won at least 10 games alongside.